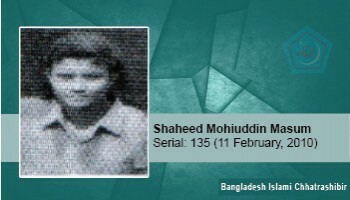 On February 11, 2010, Shaheed Masum came under attack by Chhatra League while on his way to the university from the city. He was waiting at 08:30 in the evening for the shuttle to the train like every day. In a pre-planned manner, the Chhatra League terrorists abducted him at junction of gate number 2 and injured him heavily with sharp weapons such as ramada and kirich. The doctor on duty declared him dead as he was brought to Chamek Hospital with the help of local people. Shibir activist Shahid Mohiuddin Masum, a student of Master of Political Science Department of Chittagong University, was born in Nayapara Rajar Bill village under Chakaria upazila of Cox's Bazar district. He was a resident student of F.Rahman Hall.